US demand for biologics is expected to grow 6.5 percent annually through 2015, driven by dramatic shifts in production technology and more targeted diseases such as cancer, diabetes and other serious medical conditions. Monoclonal antibodies will remain the largest category and be one of the fastest growing segments, outpaced only by hormones. 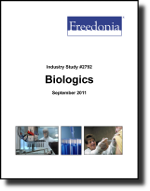 This study analyzes the $74.3 billion US biologics industry. It presents historical demand data for the years 2000, 2005 and 2010, and forecasts for 2015 and 2020 by product (e.g., monoclonal antibodies, vaccines and toxoids, hormones, growth factors, immunomodulators, blood and blood products, enzymes, coagulation factors) and application (e.g., human health care, animal health, research). The study also considers market environment factors, details industry structure, evaluates company market share and profiles 44 industry competitors, including Roche, Amgen and Sanofi-Aventis.